As designers, musicians, photographers and videographers, we’re all stuck dealing with larger file sizes than most email services can handle when we want to send files quickly to clients. There are also plenty of online file storage sites available—I posted a brief overview of these sites on the Creative Guy blog last year. Unfortunately, these options can be less than optimal, especially when you’re dealing with large file sizes (and the long upload times just to let a client download a file), the services’ overall reliability, and your own time restrictions. I had come across a few sites that offered some interesting ways of handling basically the same service, but they all suffered from the same problem for me. No matter how large or small of a file they accepted, and no matter how reliable, they still required me to use my valuable time to upload my file to them before someone else could download it. Enter BoxCloud. BoxCloud is different because you host the file on your own hard drive and share it through a small application on your computer. Not only does this offer a bit more security, but it gives you more control over what is shared, to whom, and how it is accessed. 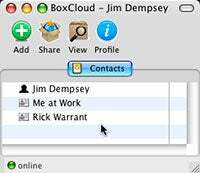 BoxCloud is Mac- and Windows-friendly, perfect for those non-techie client types. Perfect because BoxCloud doesn’t require your client to download and install some obscure application that will surely invite spyware and ad-ware onto their system. All you need is your computer and an always-on Internet connection. Sharing a file is as easy as dragging the file (or files) you wish to share over the name of the person you wish to share it with in your buddy list. They don’t need to sign up for an account, and all they need to download the file is a Web browser. What happens next depends on the service plan you decide on. BoxCloud currently offers four service plans based on bandwidth usage rather than the storage limits used by other file sharing sites. The first plan is free: It includes 1GB of data uploaded per month plus comments and tags on your custom BoxCloud page. Text ads are present on your page as well. But, if you share a folder, you get the option of sending an email with the link. Basic ($9/month): Includes 20GB of data uploaded per month. Pro ($24/month): Includes 50GB of data uploaded per month. Premium ($49/month): Includes 100GB of data uploaded per month. 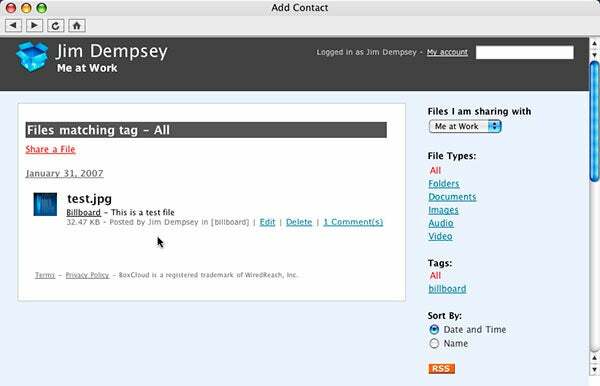 All of the service plans allow you to send the recipient an email with the link to your personal BoxCloud Web page with the files you chose to share with them listed. With the paid plans, BoxCloud can tell you when the recipient viewed the page, and (optionally—it’s your choice) cache the files on their servers if you’re not sure your computer will be online for the recipient to download from—which allows for faster download speeds as an added bonus. Since the files are stored on your computer there are obviously no file-size restrictions; only a limit of how much bandwidth is used to download files from your computer. The links are only to the shared folders, and they are only valid for 7 days, so there’s a reasonable amount of security built in. The free plan is adequate for many print designers or digital photographers who occasionally send large files to clients who do not have or cannot use FTP to transfer files. You’ll have to suffer through sending your notifications with the Web address manually, but it’s a small price to pay for a service that keeps your wallet fat for the next round of software upgrades. For more extensive needs, the Basic, Pro or Premium plans should offer all you need. With Cable and DSL accounting for 60 percent of the online market in U.S. homes (according to Leichtman Research Group ), and probably nearly as much in business as well, the need for burning a CD to take to FedEx (or hand to a messenger) is gone. Even if you choose the most expensive Premium plan, you’re most likely still saving money if you send more than two or three FedEx packages a month. You can get the same end-result using Apple’s built-in Web sharing feature, but then you have to go through the hassle of setting up password protected folders for individual clients, custom Web pages and scripting to support the features already found in BoxCloud. BoxCloud is a relatively new service, and as such it has a few kinks to work out, but overall, it is very promising. These services are supposed to save you time and make things easier for you, not create more work. BoxCloud automates virtually the entire process, allowing you to get back to work.